Wanting to kit out my G36c, but perhaps wanting to do something a little bit different from the norm? lots of different torch/laser/sight combos but just not sure? Adam that's a KV not the C . There is a version called a CV which has a KV stock .Matt if you want something different get an IDZ stock WE do them for their G39 range. 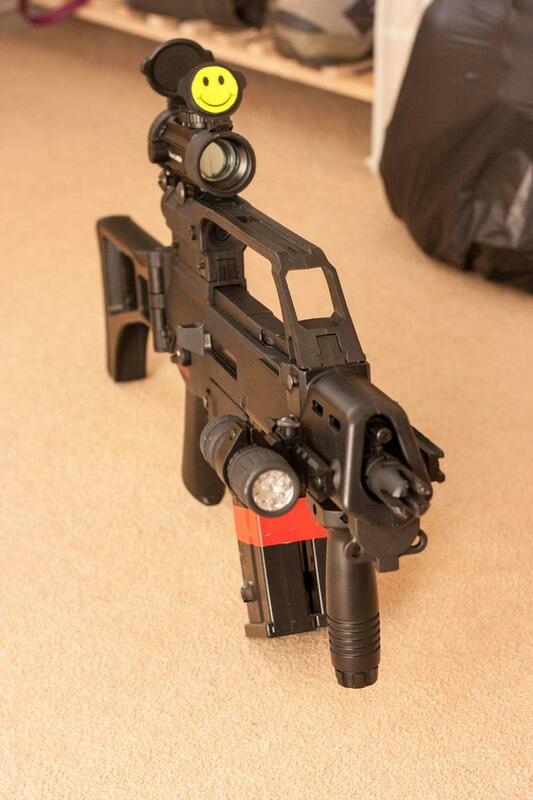 Hi Dazzer, looking at sights at the mo, whats a cheap but good red dot similar to his pic? do i really have to spend a lot? It was my first gun and it's still going! Tried to keep it quite simple and keep costs down so found ebay and my local club were cheapest for parts etc. Flash mags - ebay: £15isn each. Cool, great idea with the top rail, gives it a little more bulk, where can i get me one of those and was it easy to fit? 3 bolts to fit it mate, and completely interchangeable so you can go back to the normal iron sights if you want. Mine's a 4x magnification, but i believe you can get 2x ones as well. Since then I've added a foregrip like this. If you put a RIS on it, the latch to fold the stock will probably not work properly, that's why, if you look at mine in the Gun Picture Thread, I've added a mini-carabiner and ring-nut. And this is where I bought my carry handle scope. But yeah, if you like the look of the RIS, you can get them shorter for a C length G36. If you want a cheaper version of the 551 replica Adam has there are some called "Zombie Killer" on fleabay. I'd like to fold stock but mines rear wired and the wire goes into stock and I dont want to get it caught on anything or cut. was thinking of wiring to front look easy enough.